The Find By Name dialog (Data->Find by name) allows you to search for and locate both markers and lines. Searching is possible either via exact matching on a given name or by regular expression matching. Enter your search parameters into the search box, then click the Search button to continue. Any matching results will be displayed in the results table. You can click a result to have Flapjack move the main display to the exact position of the marker or line clicked. It will also be graphically highlighted for a few seconds. You may also wish to use Flapjack’s [bookmarks.shtml bookmark] feature to track results that are of interest without having to search for them again. Line names - select this option to search for matching line names. Marker names (current chromosome only) - select this option to search for matching marker names, with the search limited to markers that are in the currently visible chromosome only. 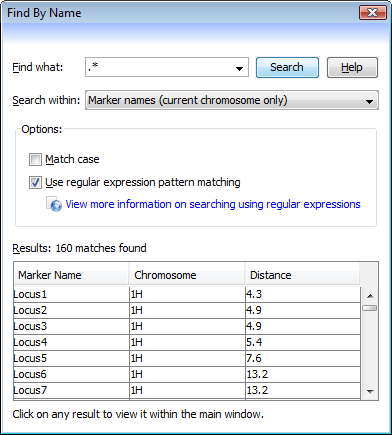 Marker names (across all chromosomes) - select this option to search for matching marker names across all chromosomes within the current data set. Match case - if this option is checked, then case sensitive matching will be performed. Uncheck the option to ignore case. Use regular expression pattern matching - if this option is checked, then you can enter a regular expression into the search box. For more details on using regular expressions, see the documentation provided at http://java.sun.com/javase/8/docs/api/java/util/regex/Pattern.html. © Copyright 2017, Information and Computational Sciences, The James Hutton Institute. Revision 1418.